Yesterday afternoon as I was aimlessly staring out the window waiting for a burst of inspiration, or motivation, or something else to help me get to work and stop procrastinating, I saw this big, dark shape fly in and land in the large maple in the yard outside. 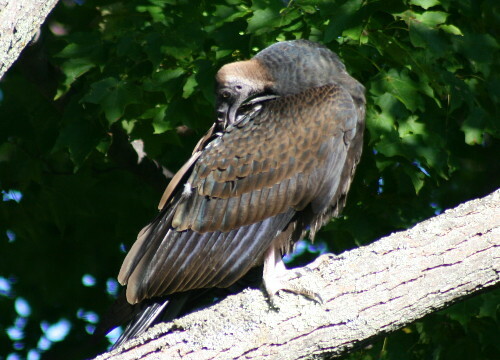 It took me a moment to realize it was a Turkey Vulture (Cathartes aura) – for one because it happened to be a juvenile, with a dark head rather than the bright pink one of adults, but also because I simply wasn’t expecting a vulture to swoop down and land in our yard. Vultures are cool birds, with many interesting habits, including vomiting when disturbed or threatened as a predator-dissuasion mechanism (would work for me), and defecating down their legs to help cool down in the summer through evaporative processes (since birds don’t sweat). Their head is bald because they spend so much time with it buried in gooey, unpleasant places where feathers would get matted and ruined – you get a neat view of a bird’s ear as a result. They are the ultimate air-thermal gliders, it’s unusual to see a vulture flapping. We’ve seen vultures soaring overhead from our property, but this was the first time I’d actually seen one on the property. This morning I spotted another first-visit bird. Likewise, I had heard Pileated Woodpeckers (Dryocopus pileatus) calling while I was on the property, and had even seen them flying from the neighbour’s to another spot, but hadn’t actually seen them in our yard. This female was out on the same big tree the vulture had perched in, but was too quick for me to get a shot of her there. She flew over to a tree that was more hidden (at least to me, the viewer) behind leaves and branches, and this was the best shot I could manage. There’s lots of Pileated workings in the dead snags on our property, so I knew this wasn’t the first time they’d been around, but it’s the first time I’ve seen them here since we moved in. 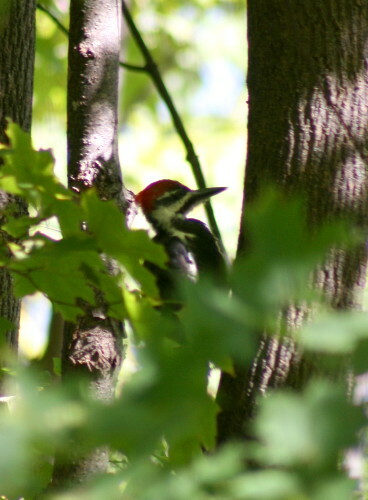 Pileateds are the biggest of the North American woodpeckers (only the Ivory-billed, which may or may not still exist, was larger), but are remarkably widespread, found throughout the east, across the boreal forest, and south through the montane forests of the west. Only three North American woodpeckers are more widespread: the Northern Flicker, Downy and Hairy. Nice shot of a turkey vulture. We get those where I live in California, too. Fascinating birds, they migrate through every fall by the tens of thousands, right around now (late September). Your blog is very nice, and I’ve linked to it from my own nature site. What a great shot of the vulture. I wish one would land in my tree. Thanks, zhakee and Huckleberry. Watching a big kettle of vultures circle is certainly pretty neat, zhakee! Brown-headed juvenile Turkey Vultures, who knew? These birds, the Turkey Vulture and the Pileated Woodpecker, are good reminders of the link between birds and dinosaurs — the one with its featherless face, and the other that’s just so goshdarn big!